Former Quinnipiac Bobcat standout forward Sam Anas was called up to the Minnesota Wild along with 14 other players for the teams postseason push as put out in a press release by the organization. 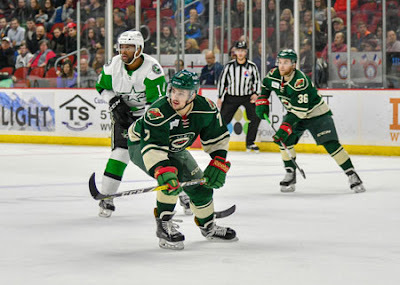 It is the first NHL call up for Anas who had 28 points (12 goals, 16 assists) in 66 games played for the Iowa Wild (AHL). He is the fourth former Quinnipiac player called up to the NHL following Michael Garteig (Vancouver Canucks), Matthew Peca (Tampa Bay Lightning) and Connor Jones (New York Islanders). Anas was an integral part of three Quinnipiac teams that reached the NCAA tournament and the 2016 team that reached the Frozen Four before falling in the National Championship game. He finished his Quinnipiac career with more than a point per game average (1.09) as he had 132 points (69 goals, 63 assists) in 121 games played. He was the NCAA top collegiate rookie as freshman back in the 2013-2014 season as well as the ECAC rookie of the year. He was a two time second team All-ECAC player (2014, 2015) and was on the first team All-ECAC in 2016. In 2014-15 he was a second team East All-American.